Dive in deeper with Finny, the Museum’s iconic artifact the 1905 finback whale skeleton that hangs above the first floor Galleria. This new experience gives visitors a chance to learn about and virtually interact with Finny. At the Meet Finny kiosk, visitors come face to face with Finny in the Finny Virtual Reality experience. 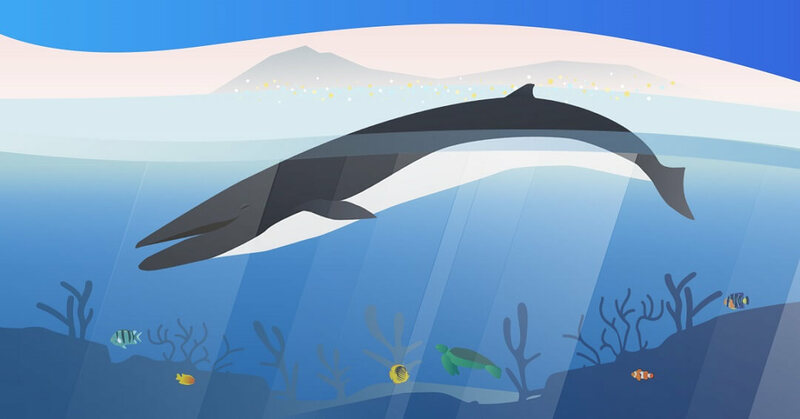 An HTC Vive headset and hand controls are available to put on and spend a few minutes interacting with Finny in whales’ natural environment. Visitors see Finny swimming around as you stand on the ocean floor, and learn about whale anatomy through the layers of its body. As visitors look through the headset, small targets will be seen on the whale, that allow users to click and learn more about fin whales. Learn about Finny’s blubber layer, internal organs and skeleton! Additionally, visitors can interact with two video touchscreens to learn more about Finny and fin whales in general. Museum visitors can explore the history of Finny, how this artifact came to the Museum and see images of Finny throughout history, as well as interact with scientific findings about fin whales, including what they eat, how big they are and more! Meet Finny Kiosk will run daily until 4 p.m.
Meet Finny was created through local partnership with Externa CGI and Freshwater Digital. Finny Virtual Reality is sponsored by Externa CGI. The finback whale skeleton has been a beloved artifact for many years. This mammoth skeleton was acquired by the GRPM in 1905 from the estate of Dr. Jacob W. Velie of St. Joseph, Michigan. Velie acquired it on a trip to Florida’s Gulf Coast, where the whale had washed ashore. 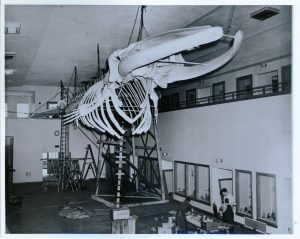 Measuring about 75 feet in length, the fin or finback whale was a mature adult weighing between 80 and 90 tons. Shaped for speed and endurance, this large baleen mammal is native to the deeper waters of the world’s oceans. The semi-flat v-shared head, tapering flippers, and broad powerful flukes aided in propelling it through the water so swiftly that few predators could overtake it. This type of whale is a member of the sub-order Mysticeti, which means “mustached whales.” The large mouths incorporate many rows of baleen plates, a horn-like substance fringed with tiny bristles. The baleen plates sift out tiny marine animals out of gulped seawater. Known as zooplankton, these form the whale’s diet. This specimen has been restored to reflect new knowledge how whales appear underwater. Cartilage and non-bone material such as the tail flukes have been reproduced here in white foam and case acrylic.